A laser diode falls under the category of optoelectronics which is a branch of electronics that deals with light-emitting and light-detecting devices. A laser diode is a special LED or IRED with a relatively large and flat P-N junction. 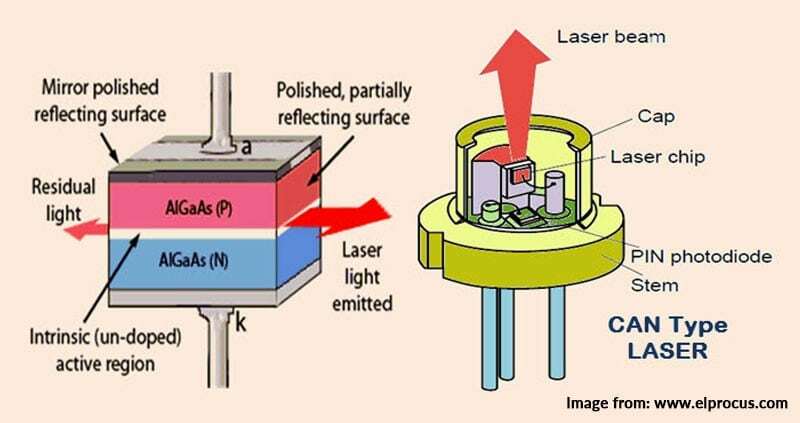 Laser diodes are light-emitting diodes with two “mirrors” on the surface of the diode to create a laser cavity. The p-n junction of the diode functions as the resonant cavity of the laser. Forward bias injects charges into the junction, causing spontaneous emission of photons. When the diode is forward-biased, charges are injected into the active area of the junction, while electrons and holes recombine in the junction, creating spontaneous emission of photons. When this process crosses a threshold level, current passing through the diode causes it to lase – in turn creating a “laser”. A laser includes a photodiode to sense the intensity of light emerging through the polished rear end of the laser diode. External electronics are necessary to control the intensity of the laser, using feedback from the photodiode. Lasing wavelength, λp: The wavelength of light emitted by the laser diode. For a single-mode device, this is the wavelength of the single spectral line of the laser output. For a multimode device, this is the wavelength of the spectral line with the greatest intensity. Threshold current, Ith: The boundary between spontaneous emission and the stimulated emission shown on the optical power output versus forward current curve. Once past the threshold point, stimulated emission is achieved and the optical output increases significantly for small increases in forward current. Operating current, Iop: The amount of forward current through the laser diode necessary to produce the specified typical optical output at a specified operating temperature. Operating voltage, Vop: The forward voltage across the laser diode when the device produces its specified typical optical output at a specified operating temperature. Optical power output, PO: Maximum allowable instantaneous optical power output in either continuous or pulse operation. Operating temperature range: Range of case temperatures within which the device may be safely operated. Monitor current, Im: The current through the photodiode, at a specified reverse-bias voltage, when the laser diode is producing its typical optical power output. Reverse voltage, VR: Maximum allowable voltage when reverse bias is applied to the laser diode or photodiode. For laser diodes with an internal monitor photodiode, the reverse voltage is specified for the laser diode as VL(LD) and for the photodiode as VR(PD). Photodiode dark current, ID(PD): The current through the reverse-biased internal monitor photodiode when the laser is not emitting. Excellent laser reliability has been usually associated with InP-based materials mainly because of their relatively high insensitivity to rapid degradation processes due to nonradiative recombination-enhanced defect motion effects, such as dislocation climb and/or glide, which, on the other hand, can occur more easily in GaAs-based materials. 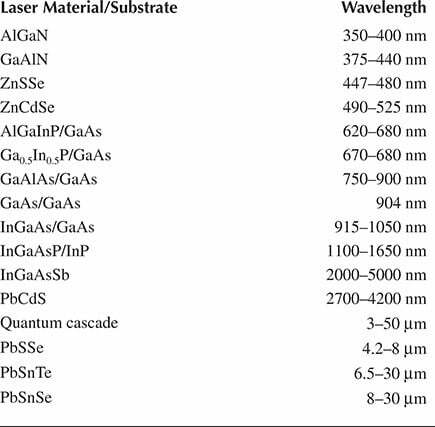 However, recent advances in laser wafer growth and processing have resulted in the dramatically improved reliability of GaAs-based compounds. 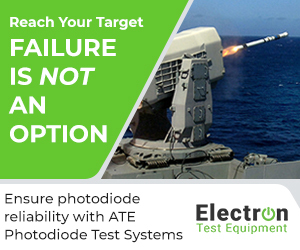 Before a laser product can be put on the market, it has to be demonstrated that operation of the laser will meet the agreed specifications under certain conditions for a specified period of time without failure. 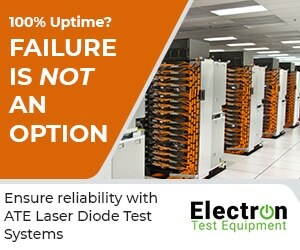 Using automatic test equipment for lasers reliability testing is critical to the performance of the laser. is expressed as the probability the laser has this ability, and failure is defined at the time when it loses this ability.